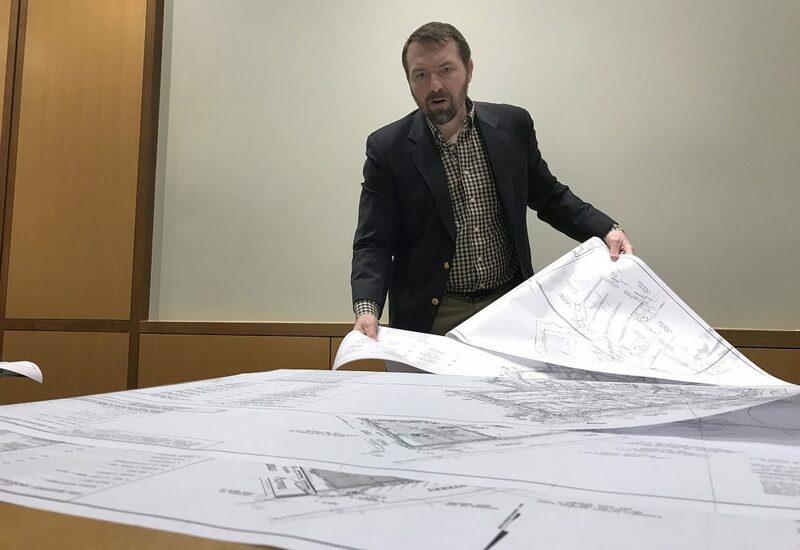 Jason Milligan on March 4 looks over documents as he prepares for the hearing in the case filed by the Norwalk Redevelopment Agency and the City of Norwalk to resume in Stamford Superior Court. Updated, 1:44 p.m.: Additional information. NORWALK, Conn. – The seemingly interminable court drama on Jason Milligan’s “POKO” properties has been paused yet again and won’t resume until April 30. Milligan and his attorney have requested an evidentiary hearing and will present at least one expert witness, who will not “meander” as Redevelopment Agency Executive Director Tim Sheehan did, Milligan said Monday. Milligan is accused of unfair trade practices and tortious interference in the lawsuit filed by the Norwalk Redevelopment Agency and the City of Norwalk, which seek to overturn his purchase of “POKO” phase II and III properties on Isaac Street and Wall Street. A hearing on the plaintiff’s request for a temporary injunction began in December but took a break until mid-January after the plaintiffs amended their complaint, changing the argument against Milligan and other defendants. There were hearings in February and March, a total 11 court dates thus far. “By bringing up an expert witness, and also having someone intelligent to talk, with no ax to grind, to be honest, it’s refreshing,” Milligan said, expressing confidence that the case against him will be dismissed. Sheehan’s recent testimony includes an estimate of attorneys’ fees. “I am very confident that we are $200,000-plus,” Sheehan said on March 6. “He’s got a piece of property that’s part of the City’s Redevelopment Plan; a prime piece of property for the city’s redevelopment area,” Rilling said last week. The properties Milligan purchased include municipal lots which the City contributed to the redevelopment project, slated to include more than 100 apartments and ground floor retail. The original developer went bankrupt, the project stalled and lender Citibank foreclosed. The properties Milligan purchased, which are the subject of the City’s lawsuit, contain parking which city officials say is crucial to resuming and completing the development. The case had been set to resume Tuesday, with testimony by Milligan, and continue through Friday, in what Judge Charles Lee described recently as hopefully the end of the hearing process. Sheehan said on March 7 that the 2004 Wall Street Redevelopment Plan had expired in June. Williams and Assistant Corporation Counsel Darin Callahan, responding to Milligan’s original request for Lee to dismiss the case, said the plan is actually good for 20 years. “I am learning how incompetent they are. They don’t know if the plan is expired, or it’s not,” Milligan said Monday. “The Court has scheduled a hearing so as to take evidence on this issue, including the testimony of any expert witnesses. The parties have the right to depose any disclosed experts prior to the hearing, which will take place in April. “An evidentiary hearing is a formal examination of charges by the receiving of testimony from interested persons,” USlegal.com states. “We will explain in the hearing and in our subsequent brief that the recent plan adoption does not affect the LDA or absolve the Milligan defendants of their tortious conduct and unfair trade practices, most of which had been completed by June 2018,” Williams wrote Tuesday. Milligan bought the properties on May 31. (Sheehan’s recent testimony includes an estimate of attorneys’ fees. Really!!! What ever happened to settling this issue out of court. These funds could have increased the Grants Budget by an additional 10% or increase the Magnet School supplements by 50%! How did you get Harry to talk about POKO? I would love to learn everything else that was tried prior to the lawsuit? It certainly didn’t involve me. I closed May 31st on a Thursday. The sale became widely known by Friday morning June 1st. On Monday, June 4th the 1st lawsuit was finalized. In fact, the lawsuit was the city’s very 1st resort, and we have been fighting in court ever since. “He’s got a piece of property that’s part of the City’s Redevelopment Plan; a prime piece of property for the city’s redevelopment area,” Rilling said last week. The Redevelopment Plan Area is enormous! It now covers the entire downtown including an awkward loop around the hospital. I own like 20 “pieces” in the Redevelopment Plan Area. Harry when is your entire explanatory statement for POKO ready for release? In December, you promised it soon and we have been waiting eagerly ever since. Perhaps it will be the key to resolving everything. I can start it for you. Four score and 7 years ago our misguided leaders set forth a disastrous plan for the downtown… perhaps the worst plan in history was concocted to gobble up every last bit of parking and replace it with buildings way too big for the historic area. The players involved lacked the vision, skills and resources to build a project half the size. The warning signs were plentiful but our leaders ignored them time after time. Additional money and resources were dumped into the project. Over a decade, extensions were given and modifications were made, some large changes were made without permission. In the end, the partially built project no longer resembled the original project. New streets critical to the project were abandoned. Parking was scrapped. The Tyvek Temple was born. There it sat and it flapped year after year. Milligan came along to expose the incompetence and bad decisions. The leaders grow embarrassed and decide to try to blame Milligan. Frivolous lawsuits designed to prevent any serious dialogue are launched, relaunched and amended. Anything to avoid public discussion of this project and our leaders past decisions. Tortous interference and unfair trade practices is what they are left with. They are attempting to invent new law by which to somehow take the properties back. NOT GOING TO HAPPEN!! Almost 1 year on there does not exist a person that can explain the POKO project. Tim Sheehan cannot define the project scope or boundaries and is not sure what properties are included. Tim says the plan is expired and then his attorneys argue it is not. The LDA was the roadmap for POKO. According to the LDA, POKO Phase I includes the Tyvek Temple, The Globe Theater (aka Wall St Theater), People’s Chicken and John Dias’s El Dorado Club. John Dias is suing the city for inverse condemnation trying to force the city to buy his property for $2.5 Million and another $500K plus in damages. Harry just come clean now. The cover up is usually worse than the crime. Does everyone know that Joe Williams travels from New Haven and he has been bringing an associate from Hartford to Stamford court. They are both staying in a luxury hotel on the taxpayer dime! I made a wise crack to Joe during one of our court breaks that this case was a goldmine for him. Joe is Mario’s buddy. (Mario Coppola also hails from near New Haven) Mario fought hard and very adeptly to slide Joe into position. I contend that Joe answers to Mario NOT the Agency. Tim says the plan is expired. Joe & Mario’s office reply to our motion to dismiss in like 12 hours claiming the plan is not expired. I think Mario ordered this response without consulting Tim or the Agency commission. Otherwise Tim may have committed purjery. Where does the Council get its information? Who does all the talking during secret session? Who was an architect of several POKO amendments & and crazy road abandonment ideas? Who is covering his behind? Can you say CONFLICT OF INTEREST??? Time for us to force Mario to step asside on the POKO matter. Let’s get some unbiased unconflicted legal advice. @Jason Milligan – excellent question. Where is the mayor’s “explanatory statement” on POKO? Promises made…. NoN – you have the direct line – perhaps you can ask Harry, when? Thinking about it – an “explanatory statement” details the factual, documented history and timeline of an event, in this case – the POKO project. Why does it feel like the delay is related to a city hall PR machine that’s not quite finished revising history? Is Mayor Rilling’s team really capable of solving these long drawn out issues ? Why is Norwalk seemingly in perpetual litigation here ? Lisa Brinton should run SOLELY on the platform to settle with Milligan out of court. Mario is a witness in the POKO lawsuit. He has testified in the lawsuit. He may also be found culpable in POKO decisions. How is he the only source of legal advice to the Council? The time for independent advise is long overdue!! The Council president is attorney Tom Livingston. He is a smart ethical guy. Tom-time to call for independent unbiased legal advice. Jason – I don’t know whether you or Redevelopment will ultimately win the litigation and I doubt anyone that reads this blog has a good enough handle on the guiding legal principles or the actual language of the LDA to say with any credibility what the outcome of the litigation will be. However, Judge Lee is an excellent jurist and I’m confident he will get it right. I don’t know that your editorializing makes any difference to that outcome. Your constant posts maybe started as a way to inform or “get your side of the story across” but it has become clear that you are now using NON and the Hour to somehow try to bully the City into giving you a sweatheart deal. I’m not sure those tactics win your court case, get the City to the settlement table, or win over public opinion. If I was your counsel I would only be telling you to post like you do if I beleived you had no chance in Court. Furthermore, the Mayor has dedicated his life to public service. From the military to the police to City Hall – he has contributed mightily to our City and country while you have bought and sold real estate for your own personal gain. I have nothing against entrepreneurship but your personal insults toward the Mayor are unwarranted. Disagree with his policies and actions but don’t imply that he is a crook. Similiarly, I have known Mario for many years and we are good friends – in fact if he was doling out this litigation to friends I can assure you I would’ve gotten it not Attorney Williams. Mario would literally give the shirt off his back to a stranger. He has a heart of gold, is ethical and is an excellent lawyer and yet you defame him as well. If you want to try the case in the court of public opinion – have at it – but take note that the Mayor and Tim Sheehan and Mario don’t stoop to your level of insults, please follow their lead and raise the level of discourse. Where did our $5 million in cash go? Remember the $5 million Duff gave Rilling last minute to cover what was then a hole in the ground and now the rotten Tyvek temple? Where is it? When will we get an accounting of the project so far? How does this project skirt the legal requirements for disclosure under the laws covering public grants? We are being fleeced. $3.4 million of the $5 million grant has been spent. It vanished into the hole in the ground. The $1.6 million remains available to anyone who should complete the project. What personal insults do you speak of? I called him a coward for suing me before talking almost a year ago. Is Harry all of a sudden mother Teresa because he took a paycheck from the government his whole career? He made the choice to work for the government. He did not volunteer. He was paid every time. He also has 3 pensions. He is accountable to the people whom he seems to have grown tired of. The phrase I hear from nearly everyone is that Harry has changed. Nice, personable guy that has been on the job too long. Thanks Jason. So $3.4 million disappeared. Would the $1.6 million be enough to demolish what is there? Pave paradise, put up a parking lot. $1.6 Million would be more than enough to demolish what is there, although that money could not be used for that purpose without changes to the grant. To demolish the rear portion of the structure which is just the steel & concrete decking area and no building above would be around $200K. There is significant salvage value for the steel that could offset some of the cost. The section that is the Tyvek Temple may be worth salvaging then again it may not. The problem is when politicians stamp their name on projects and they commit money they have a very hard time letting go. It would be really great if Bob Duff would talk about the project and the $5 Million grant. If Bob Duff would tell everyone that he understand that $3.4 million was wasted but it is gone, and that it is okay to let POKO die than it would be much easier to find a solution. Right now the POKO deniers have gone underground, and behind the scenes into secret sessions. Public input is not welcome. There is little doubt that when the POKO deniers poke their heads out with a plan that the plan will include more public money and more taxpayer pain.